The Old Anandians’ Group of 99 has done research and feasibility studies in a couple of locations within the North-Central province of Sri Lanka to select a village where we can provide a sustainable water purification system for people who do not have readily available clean drinking water. Even as young Anandians, during our school time, we have done many projects to help schools in areas of need and provide goods and facilities to the students in remote regions. Under the blessing of mother Ananda, we learned to look after others in need, while bettering our selves through education and personal development. 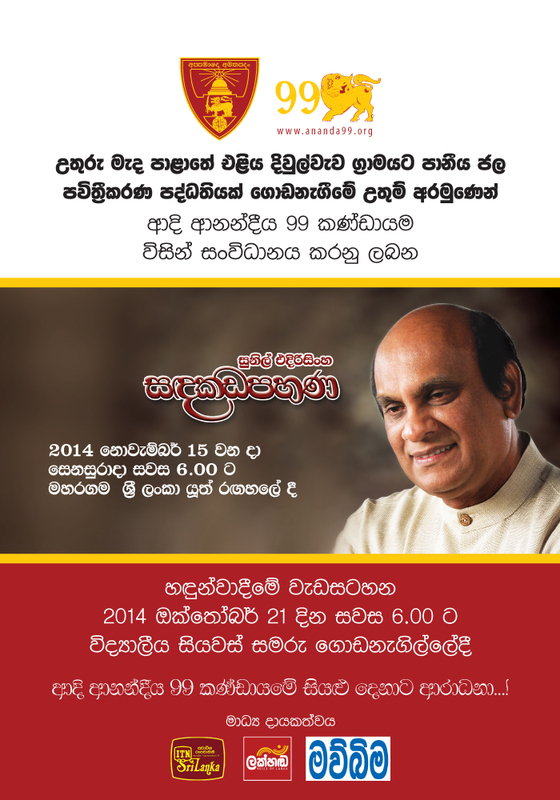 To raise funds for the Old Anandians’ Group of 99 welfare fund, we are organising the “Sandakadapahana by Sunil Edirisinghe” on the 15th of November 2014 at Sri Lanka Youth Amphitheatre. The main objective of this event is to provide a water purification system to the Eliya Divulwewa village near Eppawala. We are launching a media event on the 21st of October from 6pm onwards at Centenary Building at Ananda College to promote this musical experience we are organising.